The European Central Bank (ECB) says it will no longer produce the €500 (£400; $575) note because of concerns it could facilitate illegal activities. The decision comes in the wake of a European Commission inquiry in February into the way the notes are used. Senior ECB officials said at the time that they needed more evidence that the notes facilitated criminal activity. The UK asked banks to stop handling €500 notes in 2010 after a report found they were mainly used by criminals. 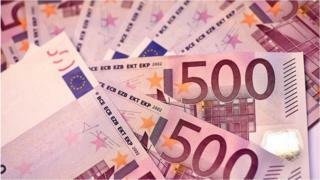 The ECB says the €500 banknote remains legal tender and will always retain its value. It will stop issuing the note around the end of 2018, when it will bring in new €100 and €200 banknotes. A report earlier this year for the Harvard Kennedy School, urged the world's 20 largest economies to stop issuing the largest notes in circulation - £50, $100 and €500 notes - to tackle crime. Peter Sands, former chief executive of Standard Chartered bank, said the high-denomination notes were favoured by terrorists, drug lords and tax evaders. Illegal money flows exceed $2 trillion (£1.4 trillion) a year, he said.